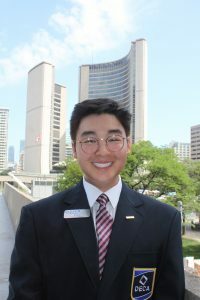 Bill Le is honoured and elated to serve as DECA Ontario’s Branding and Communications Officer for the 2018-2019 year! Bill is a grade 12 student at Blyth Academy Waterloo and has studied biology part-time at Trent University. He has competed in DECA for the past two years and has played an integral part in his chapter as Vice-President of Training. DECA has played a huge role in Bill’s life, and he wishes to inspire current members and get more students involved with DECA so they can reach their fullest potential. Both within and outside of DECA, Bill’s values lie in continuously striving to impact the lives of others. He is currently a junior representative on his school’s Student Council, volunteers at his local church, and regularly dedicates time to tutor his peers. He also supports his family through his role as a Barista Trainer at Starbucks and is certified as one of Starbucks Canada’s youngest Coffee Masters. In his free time, Bill enjoys listening to music, cooking, and is a coffee connoisseur. He is enthusiastic when meeting new people and learning about new cultures, and loves getting together with friends. Bill cannot wait to make DECA Ontario’s 40th anniversary the best year yet! He is determined to make this experience memorable for each and every DECA member and strongly encourages them to seek opportunities to get involved in their local chapter. If you have any questions, concerns, want to share a great idea you may have, or simply just chat, please don’t hesitate to reach out to him through his social media or through email at bill@deca.ca.